Every once in a while in baseball we lose a team. Good or bad, there are lots of reasons why this usually happens. Most recently over a decade ago, the Montreal Expos disappeared from the baseball landscape and some folks are rightfully so, still up in arms about it. The longer a team is gone, the more time marches on and the more that team inevitably slips from memory. I have witnessed this first hand in my area with the Philadelphia Athletics Historical society. The people who saw them play first hand aged and passed on and the memories and interest faded despite folks best efforts. The St Louis Browns have been gone for over 60 years now and probably most of the people who had seen them first hand have passed on at this point. So more than likely, other than the hard-core baseball fans, people don’t have as much of an interest in the team or its history. Today I have a book that does a very nice job of introducing a new wave of fans to a team of yesteryear and hopefully help keep their legacy alive. The St. Louis Browns were in a tough spot. Fighting for fans loyalty in a baseball crazy town with the Cardinals was no easy task. In the end we all know how it worked out, the left St Louis and pitched their new tent in Baltimore with a brand new name. They were not always the door mats of baseball as some would have you believe. There were plenty of good times in the early years, but in the end the battle with the Cardinals for supremacy just became too much. This book is a great look into those wonder years in St Louis. It takes an in-depth look at the teams roots, its early success and its fights for league supremacy. It is a great learning tool for those that are not familiar with their history or the people who wore the uniform through the years. The Browns were more than just Bill Veeck and his ahead of the curve promotions. More than just an aging ballpark, more than tiny batters and all those things everyone is familiar with. For the new generation of baseball fans this is huge opportunity to learn about a team that has fallen from the landscape but never from the fabric of the game. If we as the generations of fans, post Browns baseball do not take the time to learn about them now, then we risk losing them to the passage of time. This has happened to other teams throughout history and I would for one be very sad to see this happen to the Browns and their storied past. In each generation there is at least one player that transcends team allegiances. No matter where you are from or who you root for, there is a guy who everyone takes an interest in their career. Roberto Clemente, Bob Feller and several others come to mind, but the one that really stands out to me is Stan Musial. You would be hard pressed to find anyone who had a bad word to say about Stan the Man. He was a great ambassador to both the game of baseball and the St. Louis Cardinals. His legacy and outgoing personality carried him through life for the six decades after he retired. That is why going into todays book I had such high hopes for it. High hopes sometimes in the baseball literature world can sometimes lead to disappointment. In no way was it disappointment in the subject matter, but more the writing style. I enjoy baseball biographies more than any other genre of baseball books. With that in mind I have obviously read hundreds of baseball bio’s, sometimes three, four or even seven on the same person, so I usually know what to expect in these types of books. Stan Musial is an incredible subject for a biography. He had a great personality and always had a smile face. His career and retirement were not once touched by scandal, so Stan by that measure, is an author’s dream as far as research and a fan’s dream to read about. Wayne Stewart has made a valiant attempt to chronicle the life and career of Stan the Man. He did a very complete and accurate job on the research details on the story itself, but I think he crossed a line that is hard to walk in baseball biographies. The final story came off as more of a fan worship to his favorite player as opposed to a baseball biography. The book for my money beleaguered many points and makes drawn out attempts in explaining the details of the story. Sometimes in a biography less can be more. Obviously when it is not a first hand story you need a ton of detail to paint a complete picture for the reader. This book unfortunately does to much of that to make sure it doesn’t miss any part of the story. When the author does that, it slows down the flow of the story and the reader feels that they are stuck in that part of the story much longer than they actually are. Wayne Stewart on the plus side, did nice research on Stan and conducted some informative interviews, but the presentation of the story was lacking for my taste. There are a few other Stan Musial biographies out there that I feel flow better than this one. 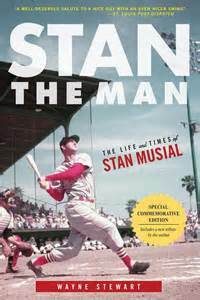 If you are a big Stan Musial fan, you more than likely will be able to overlook the slow pace of this book. I think the fan that has admired Stan the Man from afar is going to have more trouble embracing this book, like I did.